My girlfriend has a 2000 Ford Taurus that we're trying to pass inspection in Maryland. One of the issues that I've been struggling with is that the power windows don't always work. I've checked all the fuses and none of them are blown. I didn't think it would be a fuse because if it was blown it would open the circuit and they would never work. I checked the relays...specifically the accessory delay and one-touch down relays. They all appear to be functioning correctly. Another thing I noticed is that the dome light doesn't always work...and that it appears to be linked to the power windows too. If you open the door and the light doesn't come on...the windows will not work. If you open the door and the dome light turns on...then the windows will work. I remember one time when the windows weren't working, I was trying to remove the fuse panel on the driver side. When I took it off, the dome light turned on suddenly. I checked the windows and sure enough they also worked. I then shut the door and opened it back up and the dome light stayed off and the windows wouldn't work again. I read somewhere to try spraying WD-40 in the door latch...but that didn't make a difference either. Does anyone have any other ideas or things I can try? When you say harnesses, do you mean the wires that plug into the driver side window switches? I have a 2004 with the same problem. I had a what looked to be a large ground wire that was broke between the door and the body of the car. I repaired that broken wire and have not had a problem since. Last edited by jag1959; 10-15-2013 at 03:23 PM. So to check any of these connections...I'm assuming I have to remove the door panel (similar to whats demonstrated here http://www.youtube.com/watch?v=m1CaEXsa0Xg)? Or are there any easily accessible spots I can probe/ohm out? I'm comfortable checking the wiring because I have an electrical background...but I always worry about breaking things when I have to do some disassembling. 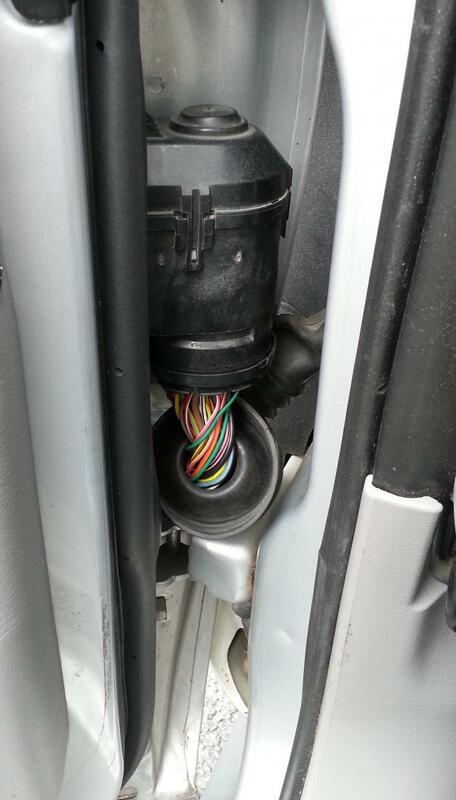 Definitely check the large wiring bundle between the body and door for wiring damage, breaks, etc. I finally got around to looking into this problem again today. I checked out the harness between the door and body. I had to cut a zip tie and then i pulled the rubber sleeve down as far as possible. I looked over the wires and they all seemed to be in good shape. None of the wires were broke or chaffed. It looked like a previous owner cut a small hole in the bottom of the rubber sleeve to allow water to drain out. As I was looking through the wires around, occasionally the dome light would turn on. If I found a magic spot where light stayed on, the windows would also work. However, if I moved the wires again, the dome light would usually turn back off. It seems like there may be some corrosion or a loose pin in the hard plastic housing. How do I get in there to look at it? Would it be smart to try and spray some contact cleaner in through the bottom?